Summertime is about casual and relaxed entertaining and this year, much of our entertaining is happening outdoors. There is something about summer that invites one to sit back and take things down a notch. That also translates into how I dress and how I set my tables during the warmer months. It's about having fun and casual dining al fresco. Whether it is a barbecue, clambake or elegant dinner for two. This weekend, I pulled out all the stops and planned a quiet dinner for my hubby and I poolside. The sun was out and the temps were ideal for spending the day by the pool. There was delicious seafood, cold ice tea, wine, and lots of fun in the sun. Such a fresh and festive way to elevate the occasion. Of course my tablescape was inspired by the blue hues in the pool. 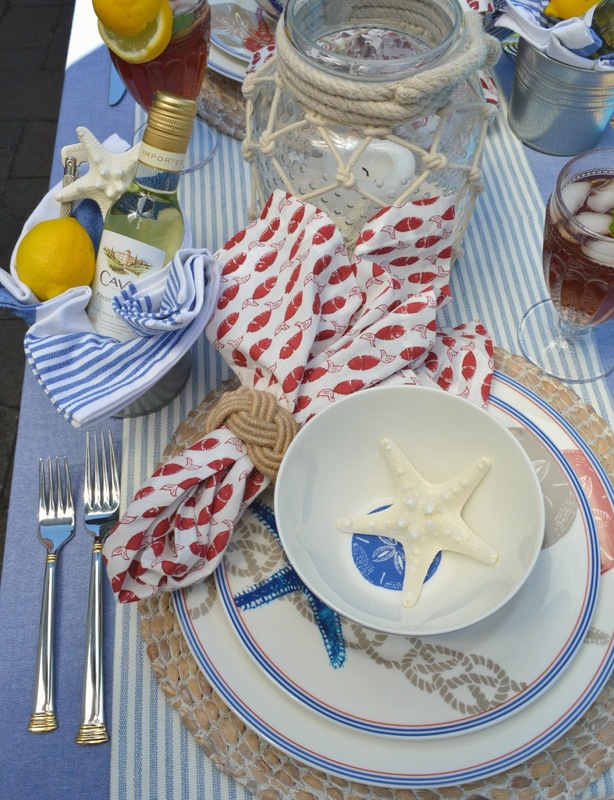 Linens in simple shades of blue and red enliven the table and just for fun; I used my playful Oceanside dinnerware by Lenox that is decorated with starfish, sea horses, and sand dollars in vibrant red, white and blue which sets the tone for my coastal tablescape. All come together to emit a relaxed feel as we kick back with a glass of favorite wine. I always like to add an element of whimsy and interest. For this table, I simply used a small metal bucket to tuck in a napkin, lemon and small bottle of wine. 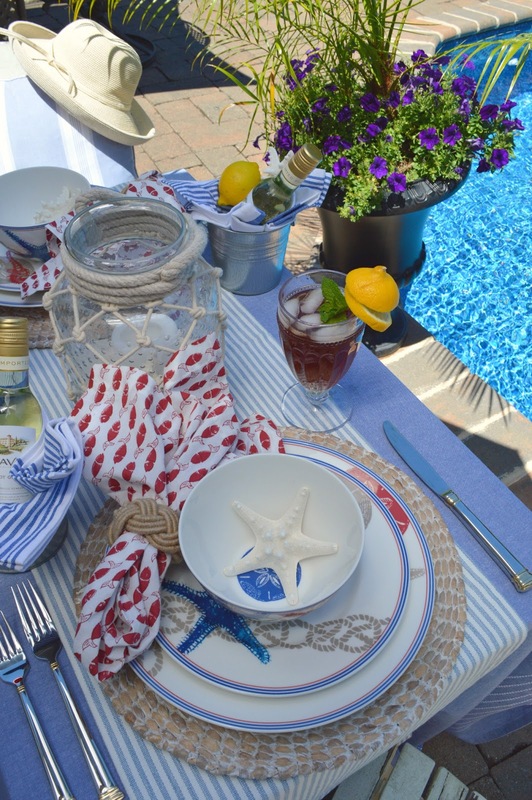 I also used natural starfish to decorate each place setting. Thank you for stopping by today sweet friends. Always remember to take time to do something special. Whether it's buying yourself petty flowers or having a cup of tea in your garden. Make everyday special. This is gorgeous. I can't wait to have dinner by the pool. Thanks Marty. I truly appreciate your kind words. You will love having dinner by the pool. I hope you had a fabulous weekend.... Thank you for your lovely comment. You always say the nicest things and I couldn't be more grateful. Have a blessed week dear friend. Janet, I love this! Those single serve bottles of wine are perfect for a tablescape. 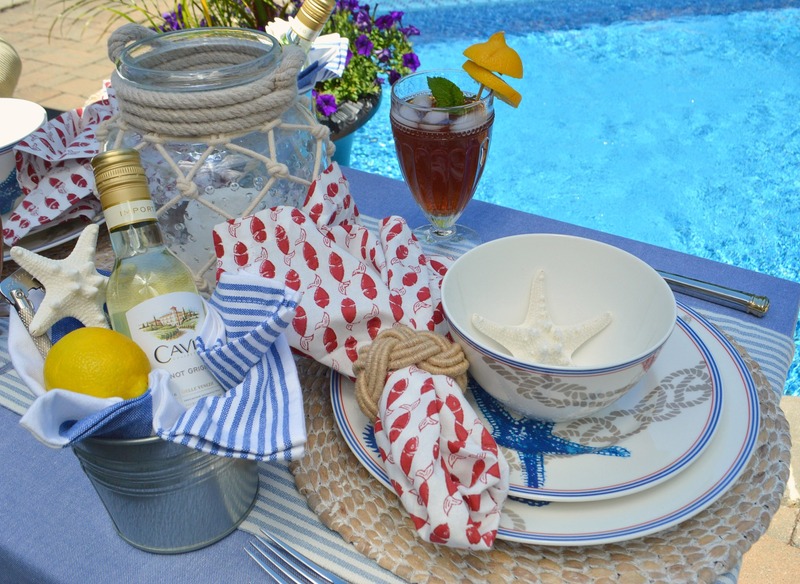 The dishware, textiles, the water.....perfect summer scene! It's so wonderful to have you visit. Thank you for those sweet and kind words. I am extremely grateful sweet friend. Wish i had a pool. This is what summer is all about. Beautiful table. Thank you for your sweet and lovely comment. So thankful and grateful. Love it! My favorite colors and surroundings. It is so wonderful to have you stop by. Thank you for your visit and kind words. Love that you set the table so nicely just for you two. It makes a regular day extra special! Your table is pretty! Thank you for stopping by. I enjoy setting the table for hubby and I. It is something that we both enjoy very much after a hard day of work. How relaxing! That sparkling water is calling to me! Thanks for sharing at Home Sweet Home! Thank you Sherry. It is always a pleasure joining your party. The water was calling my name too. Janet, this...is...BEAUTIFUL!!! What a lovely way to spend a date night in with your husband!!! I'm glad the weather was such that you could do that. We've been swooning in the heat here, and I don't think there's one single person who won't be glad when Fall rolls around in KC!!! It has been absolutely brutal!!! But this...this is gorgeous! 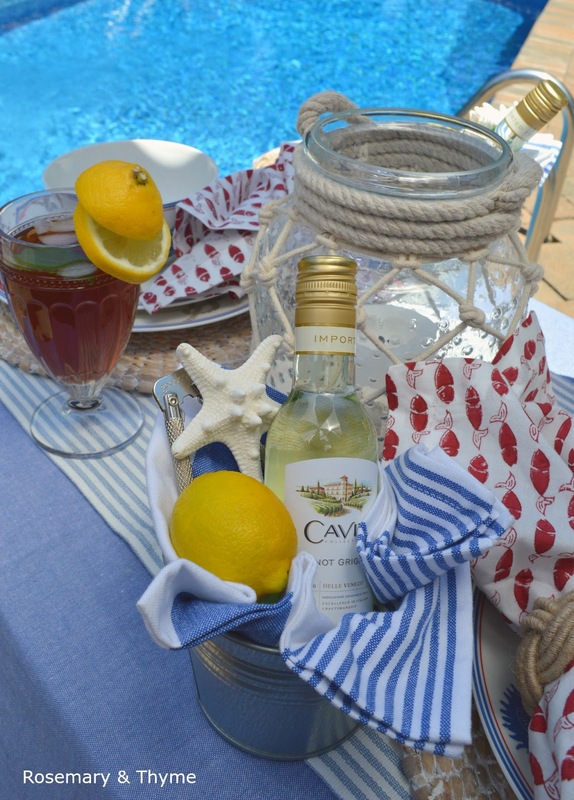 This is perfect for poolside or lakeside or at an oceanfront cottage! (Wouldn't mind having one of those!) I love the touch of the wine in the pail! I'm all about those napkins, too! 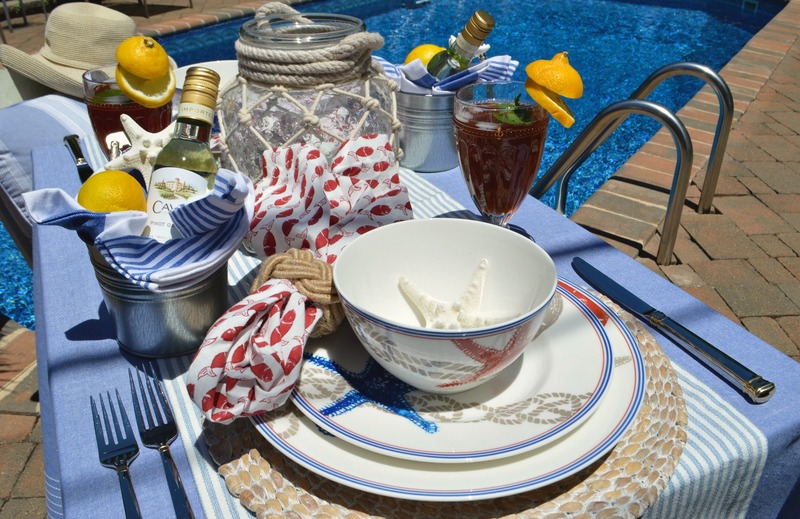 Janet, the poolside tablescape is just perfect for summer. I think just looking at it brought my temperature down a notch. :) It's been quite hot here. Thanks for sharing with SYC. I would have liked to have featured you today, but I'm not seeing a link back to the party. Sorry, but that is a requirement. What a stunning post! I am so happy to be featuring you at TFT this week! I hope you will join us again this week. Have a great weekend! Thanks so much Amber. That means so much coming from you. I am extremely grateful and honored for the feature. We have to collab soon. 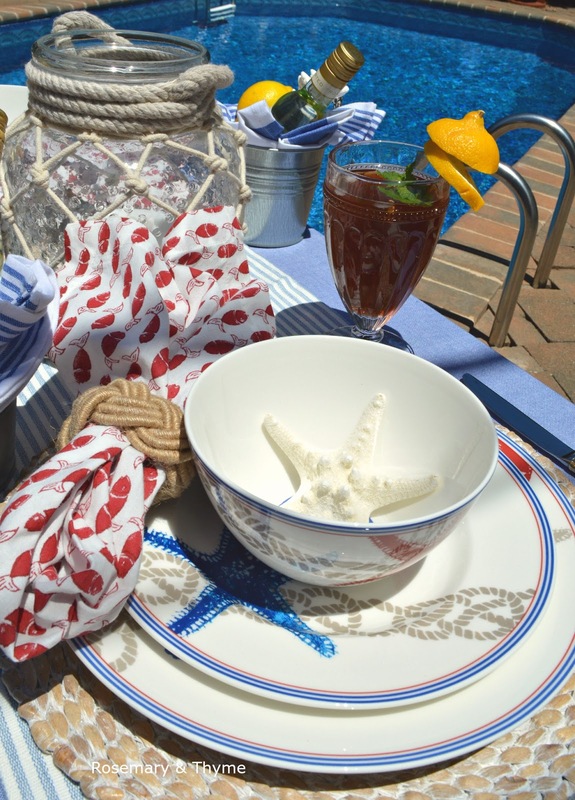 This table is right up my alley with your nautical and coastal accents! I would be happy to sit down and share a meal at this table! 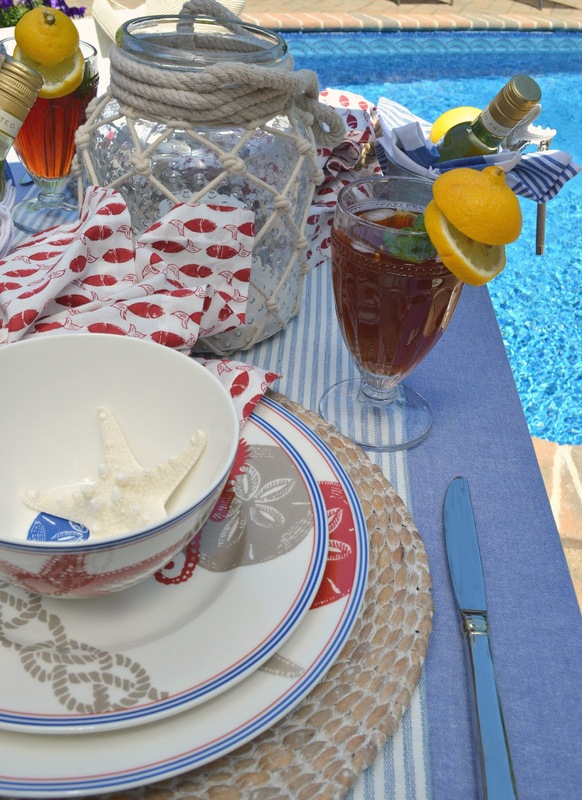 I love the pale blue and white runner and your red and white fish napkins! I am always delighted to see a pretty well-styled table! Thank you so much Chloe. It is wonderful to know that you enjoyed my nautical table. I love anything coastal!! It would be amazing to share a meal with you someday.